Disclosure: I received a complimentary copy of this book through LitFuse Publicity, in exchange for an honest review. The opinions stated below are entirely my own. I truly wish that I had more time in my life to read. I would spend a significant amount of time curled up on the couch with a hot cup of coffee and a delicious novel. I am so lucky that I have the opportunity to review books, as they are one of my favorite items to receive. Furthermore, when I get a book that I can take away from, I'm excited to share my thoughts and opinions. 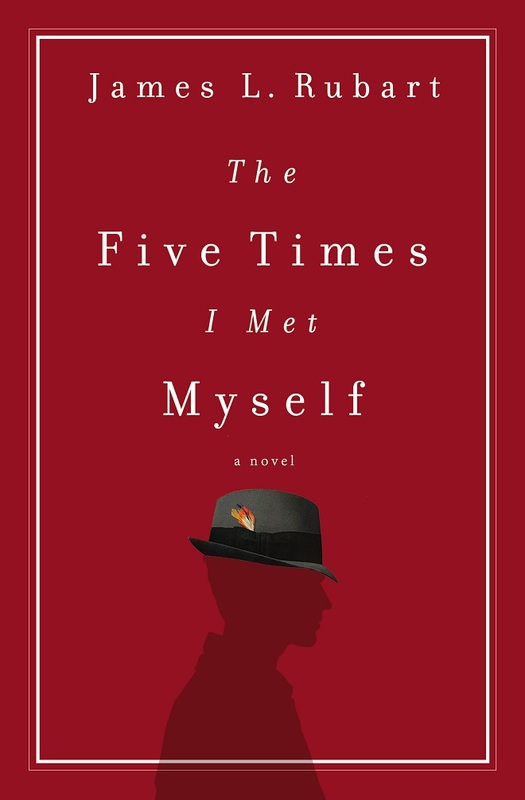 I recently read The Five Times I Met Myself by James L. Rubart, and was able to take so much away from the read. In short, the novel is about a middle-aged man, Brock Matthews, who has found himself at a point in his life that is less than flattering. The coffee shop he co-owns with his brother, and his marriage seem to be falling apart right in front of him. He begins having dreams about his father, who had passed away earlier; Dreams that leave much to desire. So, when he was introduced to lucid dreaming, where you can control what happens in your dreams, he began a quest to change the past via his dreams. You see, Brock notices that the decisions he was making in his dreams were carrying over to his real life. It brings a whole new meaning to turning back the hands of time, and having your dreams become reality. It is worth noting that this book is Christian Fiction, so the overall message of the book does lean towards God and faith. This book was one of those books that makes you think as you read it. You begin to wonder how different your life would be if you had made one different decision. I was very intrigued by the style of this book, and was easily sucked in to the characters and story line. The concept of lucid dreaming and then those dreams becoming reality was clearly a hint of science fiction, however, it was unique to me, and I thought that James L. Rubart did a wonderful job with it. This novel kept me up late reading, held my attention, and had me thinking on an even higher level about life itself, and my personal faith. 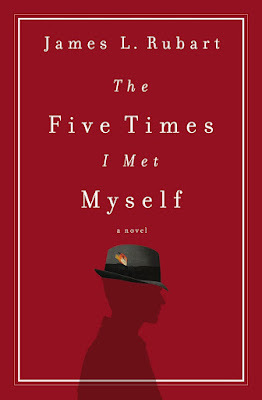 Read what other LitFuse members are saying about The Five Times I Met Myself, HERE. If interested, you can purchase a copy for yourself, or a copy to gift HERE. I think we oftentimes take for granted how truly complex our bodies are, and the intricacies that make it function. I can't remember how old I was when I realized that we have bacteria in our body, and that some of it is actually good. For example, when we take a round of antibiotics, we knock out ALL of the bacteria in our body, good and bad. There are times when the good bacteria can get a little out of balance, and then it becomes bad. Candida, for example, is yeast that can be found in our body. This is fine at normal levels, and develops symptoms if there is an overgrowth. Due to the food and lifestyles of many people, this is very common. Luckily, there are supplements that can bring homeostasis back to your body, such as Zahler's CandAID. Zahler's CandAID is formulated to flush out excess yeast in the body and bringing balance back to intestinal microflora, while building the bodies resistance to future candida over growths. This particular product is marked towards those who suffer from Candidiasis, Yeast Infections, Thrush and Bacterial Vaginosis. CandAID comes in a large bottle with 120 easy-to-swallow capsules. The directions on the bottle say to take one capsule with a meal 4 times per day. The instructions on Amazon say to take 2 capsules with a meal 2 times per day. Each capsule contains Caprylic Acid, Grapefruit Seed Extract, Oregano and Garlic to help your body rid itself of excess candida. These ingredients have been shown to be effective in combating candida. Fortunately for me, I do not experience yeast infections frequently. That being said, my dog often gets yeast infections in his ears, as they are very cavernous, warm and will retain moisture. I have been using these pills with him, as I also read that another reviewer was doing something similar. My pup is very prone to these infections and gets them at least once per month. We clean his ears out constantly and are very careful when bathing him, however, they still are an issue. I have been giving him 2 pills in the morning and 2 pills in the evening (be advised that he is a 100 lb black lab). I am hoping that with continued use these issues will disappear or become less frequent. I have noticed that overall he is less itchy and shakes his ears less frequently, his ears do not smell and they are keeping clean. I will say that I also took these pills for a number of days before I gave them to the dog. I can be very skeptical of supplements because they are not regulated by the FDA, but fortunately, these ones are all natural, and produced in a GMP certified facility. If you suffer from an over growth of candida, I highly recommend Zahler's CandAID, which can be purchased HERE. I appreciate when I get the opportunity to review books, and especially when I get to review books with my son. He isn't always fond of reading, but when we do it together, it gives us something special to do one-on-one and gets his daily 30 minutes of reading homework completed, so it's a win-win. We recently read A Chameleon, A Boy and A Quest by J.A. Myhre, and it was a great read! What I found even more heartfelt about this novel, was that the author wrote this book for her four children as a Christmas gift while they were living in an African village. They began reading it together on Christmas Eve, and then each night throughout the Holiday season. 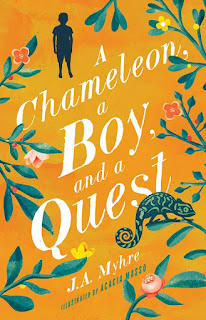 A Chameleon, A Boy and A Quest is about a young African boy name Mu, who is a slave to his family in the African village he lives in. 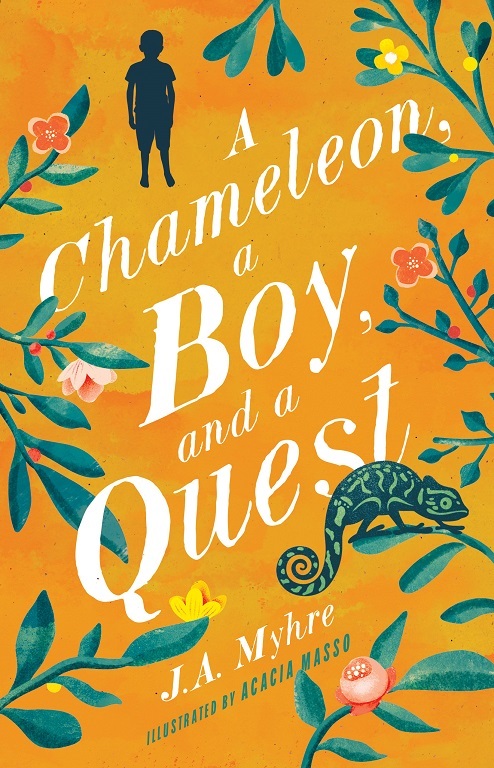 One morning, as he is going to retrieve water for his family, he is approached by a talking chameleon, who informs him of a quest they must take. From there, Mu is brought on the adventure of a lifetime. From the danger and excitement that they encounter, children can learn about perseverance, good versus evil and humanity. The novel itself is thoroughly detailed and even contains pictures to bring the words to life on the pages. My son and I enjoyed reading this novel. It is relatively short (153 pages), which makes it less overwhelming for my reluctant reader. While it took a little while to get into it, once we did, we both looked forward to our reading time each night. The names and places are African, so we were always unsure of their actual pronunciation, however, it is those cultural details that give a nice lesson too. In the back of the book, there is a glossary that explains some of the phrases or unfamiliar concepts that kids may have questions about. What I really loved about this book was the lessons learned. Nowadays (and I say this as if I have been around for so long....), kid's books just lack the sustenance they once had, the lessons, the morals, the purpose. Now there is such a focus on getting kids to just READ that many books are written on interest based material versus with words that have true meaning. I always strive to find reading material that leaves us with a lesson learned and even better, with something to talk about, or issues that ignite a discussion. A Chameleon, A Boy and A Quest did just that! A great read for sure! Read what other LitFuse members had to say about the book HERE. One of my favorite ways to relax and treat myself is getting my hair colored. I have gone to the same hair stylist my entire life, and we have a ton of fun picking out color combinations to use in my hair. Plus, I am never left displeased with the results. One of the most important things I like to remember before getting my hair colored, is using a clarifying shampoo and conditioner for a little while in order to "prep" my hair to take the color better. I am not a stylist, so I do not know the science or the specifics behind anything that has to do with hair, but it was a recommendation she made awhile ago, and that always stuck with me. Since I will be getting my hair colored in a few short weeks, I have been consistently using Follicleanse OS Clarifying Shampoo and Conditioner. Follicleanse is a brand that has been around since the 90's. In fact, the creator invented the line because he was suffering from slow hair growth and itching, flaking, and redness of the scalp. When he managed to work his way through everything on the market to no avail, he decided to do some research. Surprise! The very ingredients in the products intended to rid our hair and scalp of difficulties, can actually cause them! 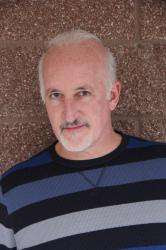 He created Follicleanse with gentle and effective natural ingredients meant to cleanse the hair and heal the scalp. The Follicleanse OS Shampoo and Conditioner are intended for use with normal to oily hair. This system uses Zinc, Fenugreek, Sage, Burdock and strengthening proteins to rid your hair of styling residue, build-up, oil, and irritation. They are available in 16 fl oz and 32 fl oz, and can be purchased individually or separately. Along with the Follicleanse OS products, they also offer the Follicleanse DS system which uses Emu Oil, and is intended for normal to dry hair. I found this to be a very helpful system for me. I have been using this duo on and off for a couple of weeks. While I am sure that it would be perfectly fine to use day to day for the entire family, I have chosen to use it here and there when I feel that my hair and scalp are in need of some deep cleansing, or special attention. As I mentioned earlier, I am getting my hair professionally colored at the end of the month, so I will continue to use this to really clarify my hair follicles to allow them to be the most "prepared" to take to the hair color. The shampoo is greenish in color, and watery in comparison to your typical shampoos that you find at the store. I think this is the reason the directions state to use a half dollar sized amount. The conditioner, on the other hand, is thick like other conditioners I have used. I really like the scent of these, and they leave my hair feeling cleansed and manageable, while my scalp feels refreshed and soothed. I am pleased with the majority of the ingredients used in each of the products, and love seeing so many natural things on the list. I really wish the 16 oz bottles had the pump tops like the 32 oz bottles, but I suppose I could buy some for relatively cheap if I really wanted to. You can purchase Follicleanse product on their website HERE. I love testing skin care products. I have found some truly amazing products that I otherwise would have never even known about. Hence the reason I share my experiences with the rest of the world that can find my blog. With the weather changing here in Upstate NY, I start using heavier moisturizers for my face, as my skin leans toward the dry side once the heat starts pumping in the house. There are a couple of moisturizers that I am VERY fond of that I have found on Amazon, and the SkinDaily Skin Care Solutions Active Hydration Moisturizer is one of them. 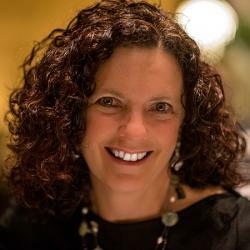 Skin-Daily is a company that focuses on creating skincare products that use only the highest quality natural and organic ingredients to create effective skincare that meets the needs of their customers. They make their products in small batches in their FDA-certified production facility, which fines tunes their level of quality control. The Active Hydration Moisturizer is an anti-aging moisturizer that uses hyaluronic acid to deliver an intense level of moisturization and amino acids to hydrate, repair and regenerate your skin to look more youthful. It comes in a sturdy 3.4 fluid ounce bottle with a pump top, and is formulated with only natural and organic ingredients. I have tried a number of skincare products from Amazon, and moisturizers in particular. While there have been none that have been total duds, I have come across 3 that are my favorite of all time. I have a pantry full of health and beauty items (things I have stocked up on when they were cheap, things that I bought when I had coupons, and items I have received discounted for reviews). It takes me a long time to use up full sized products because I often switch them up, get something new to try, etc... but I have 3 moisturizers that are very similar to one another, and which are my absolute favorite ever. THIS is one of them. I LOVE this moisturizer. I have break-out prone skin, and come Fall and Winter, I also get dry patches that require deep hydration. I love that it is fragrance free, formulated with specific ingredients meant to be gentle for even the most sensitive skin, and the pump-top container makes this one very easy and mess-free to. I use about half a pump and rub it all over my face, day and night. This provides ample hydration to your skin without being oily, greasy or sitting on top of your skin. I'm impressed with this formula, as it never broke me out. I typically break-out with the introduction of new products into my skincare routine, but this never caused an upset. I love the way it makes my skin look and feel, and will be using this throughout the Winter for sure. A little goes a long way,so I anticipate it being around for quite awhile. I highly recommend this moisturizer and was pleasantly surprised when I saw that the price was also very reasonable. You can purchase the SkinDaily Skincare Solutions Active Hydration Moisturizer on Amazon, HERE, where is it currently $22.97. You can also check out their website and Facebook to keep up with the brand and what they are up to.